All parabolas are symmetrical, right? Today I was teaching one of my classes about drawing graphs. It was going well, we’d moved from linear to quadratic and discussed the shape. After a few minutes of plotting quadratic graphs from equations one of the students asked, “Sir, these parabolas are all symmetrical, right?” we discussed it briefly and he decided that yes they were. Then he carried on working. I was circulating the class and I noticed he was flying through the work so I asked him to explain why he was going so much faster. He said, “I’ve found a short cut sir, cos they’re symmetrical you once you see when they start repeating you can easily just work out the points from the ones you know.” I was impressed by his mathematical thinking, although I wasn’t as impressed with his explanation, although he did manage to refine it and explained it much better to one of his class mates who had overheard our discussion and wanted further explanation. The student had seemed surprised when I approved of his method. I think he thought I’d chastise him for not working all the points had. But a massive part of mathematics is pattern spotting and he’d spotted a pattern within the shape of a quadratic graph and used it to streamline his working and get to the correct answer. By spotting this he was working at a level that is streets ahead of the actual work set and I think this needs to be encouraged. It’s made me think about things I teach, and if I’m building in enough opportunities to think like this. I know I do build them in, and encourage the thinking through questioning, but I’d never considered asking about this so I figured I’d try to think where else I could find ideas like this. Last Saturday at the “celebration of maths” event, one of the things Mel Lee (@melmaths) spoke about was work scrutinies. She asked the room what actually gets scrutinised, is it the work done by the students? Or is it a process of looking solely at whether a teacher has stuck to policies? What do you think it should be? A recent conversation with a former colleague revealed that at their school they no longer use the term “Work Scrutiny”, but have replaced it with the more accurate “Marking scrutiny”, and from conversations with others I feel that this term would be more accurate in the majority of schools. It made me think about what we should be trying to achieve through work scrutinies. Obviously, I’m not suggesting that a work scrutiny should happen and no quarter paid to the marking at all, but I do feel that the process should be aimed at ensuring the work is enabling the learners to progress. The work being set and completed should be scrutinised, and the feedback should be constructive and aimed to help the teacher improve the learning process. This is where Mark Miller’s (@GoldfishBowlMM) “Marking Conversations” come to prominence. Instead of random book selection, ask a teacher to bring the best book from a class, the worst book and one in the middle, and discus why they are that why. Look at the work, is it appropriately pitched? Look at the feedback given, is it helpful? Is it on point? Does it aid learning? Or is it retrospective and aimed at ticking boxes? I had a conversation with colleagues from other local schools during a maths network meeting. The topic of feedback was discussed and someone said they have staff members who are consistent spending 6 hours per class marking every two weeks. That’s a ridiculous and unworkable amount of time to spend marking, and the majority of the time spent is going to have little impact. Comments written retrospectively on work two weeks old are going to have very little impact on learning. I feel there is a better way, books should be constantly marked. I don’t mean everyone should mark every lesson. I spoke to a HoD who does this, he said it takes him 30 minutes per class, so a full timetable teacher would need 2.5 hrs marking a day near enough, which doesn’t seem sustainable. Books should be marked in lessons. Feedback and comments are instant and can affect the direction a lesson goes. You can move learners on at their own speed, and offer extra scaffolding and examples to those who need it. You may not get round the whole class each lesson, but if you are aware who you miss then you can catch them in the next. You should be able to see a whole class in two or three lessons. When you mark the set of books then there is already comments, feedback and dialogue. Your marking can be focused on catching any misconceptions you’ve missed in lessons and picking up any repeated errors. You can point out areas that when we’ll and set individual targets to improve. I’ve also taken to marking with my phone next to me so I can snap pictures of good work and common errors to show in the next lesson. 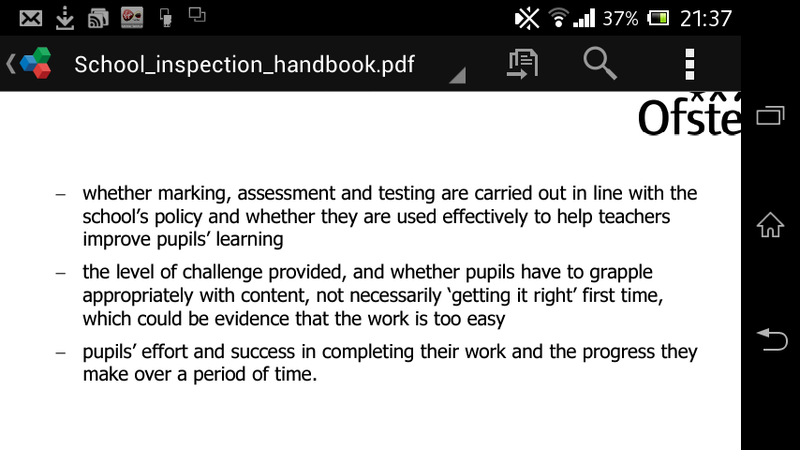 Marking should be about improving learning, not about ticking boxes that someone thinks ofsted want to see. I’ve heard some horror stories of late, people having to mark using 3 different coloured pens (one for progress, one for effort and I can’t remember the third) and two different coloured highlighters. People having to mark with 8 stampers next to them. People being told their books are inadequate because pupils haven’t used a ruler to draw the “bus stops” when completing short division. 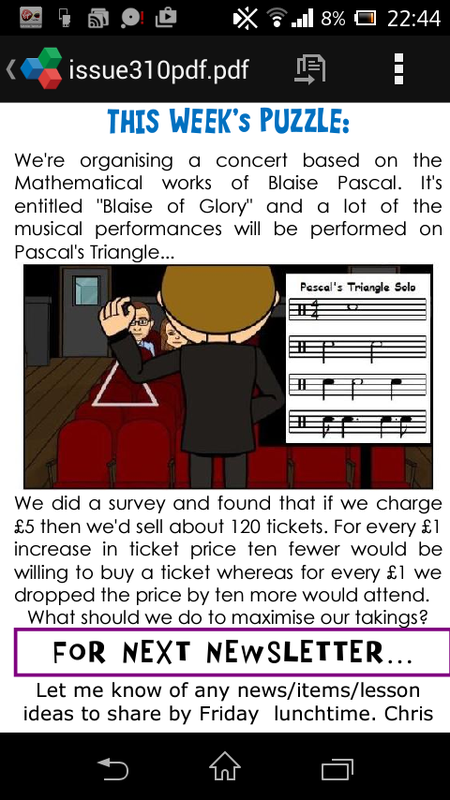 So these ridiculous policies make more work for staff and make it harder for the school to satisfy the criteria than a sensible policy that is built to “help teachers improve pupils’ learning.” Instead of trying to second guess an inspector, write a policy which will help your pupils. That’s what ofsted actually want. Have you “liked” brilliant.org on Facebook yet? Have you downloaded the app? If not, you should, it’s hours of fun. The Facebook page posts a stream of puzzles and problems to get you thinking, most can be solved mentally and serve as a nice exercise when you have a few spare minutes. A lot of them are a little less obvious than they appear! 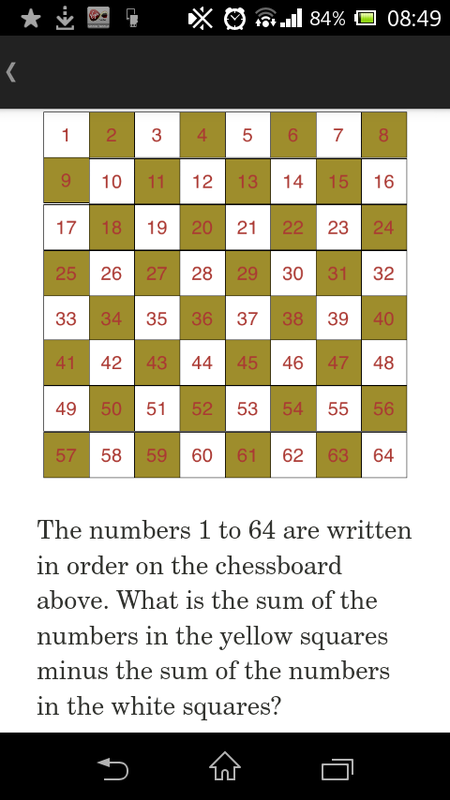 The numbers 1-64 are written in order on a chessboard, what is the yellow sum subtract the white sum? Fun, isn’t it? Have you got an answer? Good. At first I thought, duh, it’s clearly 32, the yellows are all one more than the whites, but then I noticed that 64 fell on a white square. I realised I’d made a false assumption! An easy trap to fall into, the colouring of the chessboard is such that the end of one line and the beginning of tge next are the same colour, leading to a situation where every other line it is the white that is 1 greater than the yellow, leading to an answer of 0. I like this as it serves as an excellent example of why a sketch or diagram can make something a lot clearer, and I may try it out on my sixth formers to see if they fall into the trao and try to hit home the message about diagrams. I’ve still got some who need constant reminders to sketch mechanics and graph problems!